Places three trendlines (in a pitchfork pattern) from three points of an identified trend. The middle line is centered between the two outer lines after they have been placed on their trend points. 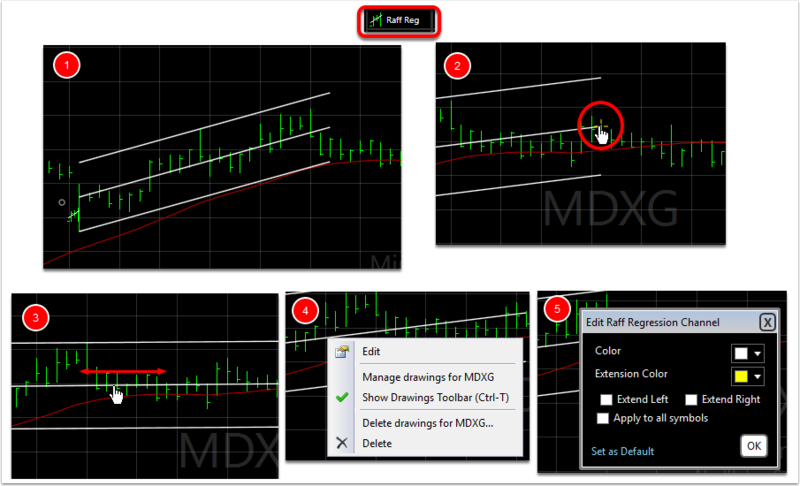 Click and drag the cursor from a lower price point to a higher price point on the chart(1). This places the three trendlines on the chart. Click and drag each of the pitchfork corners to highs/lows of an identified trend(2/3). 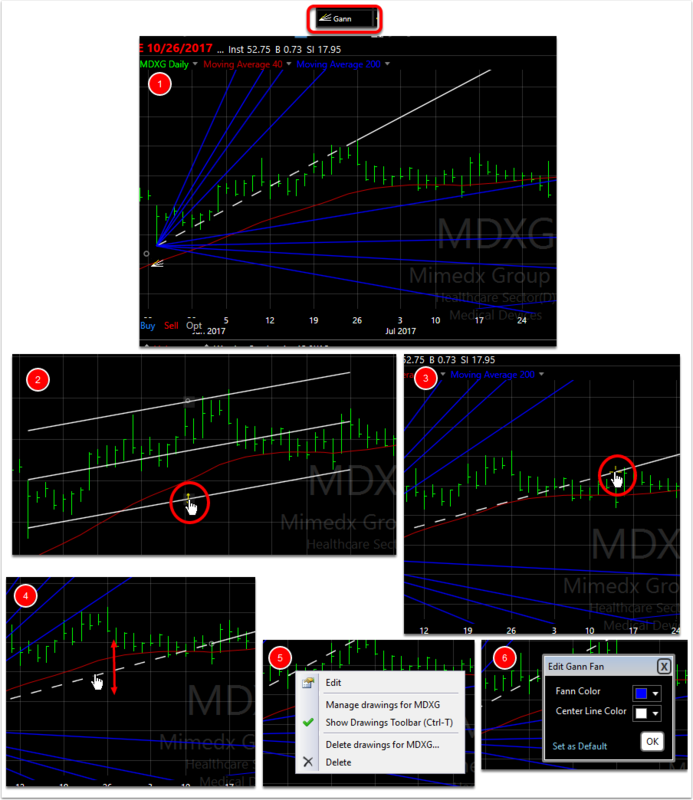 Click and drag line to move entire Pitchfork vertically on chart(4). Optional: Click on the line for the drop down menu and choose Edit(4). Change colors(5). Places three lines on the chart calculated by plotting two parallel lines above and below an x-period linear regression trendline. The lines are plotted a specified number of standard errors (a standard deviation of the mean within a data set) away from the linear regression trendline. Click and drag the cursor from one bar (date) to another bar (date) on the chart(1). This places the three trendlines on the chart. 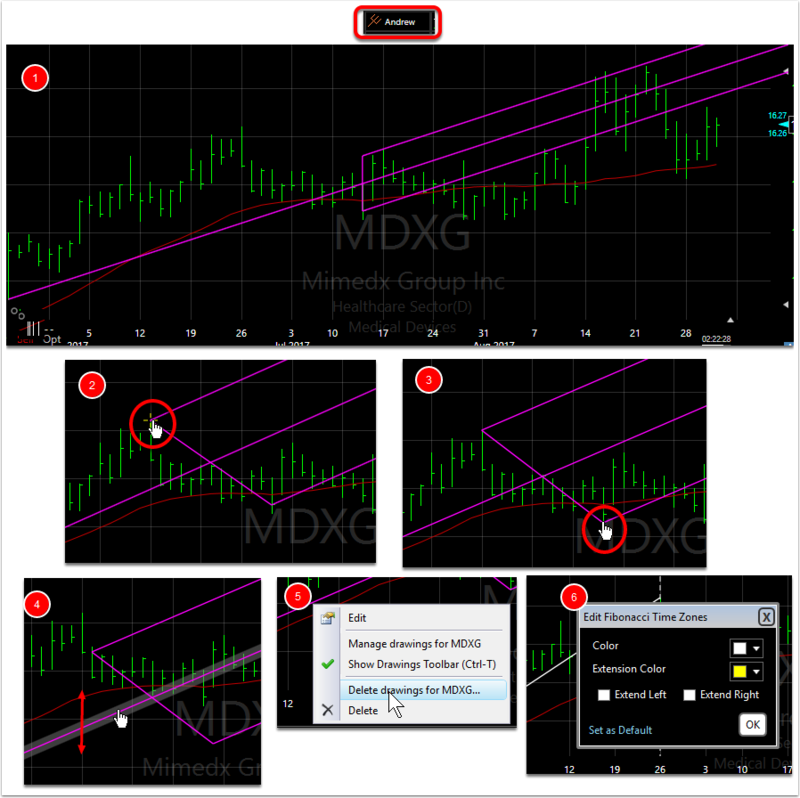 Click and drag either of the outer trendlines to reshape the channel to fit price action(2). Click and drag either endpoint of the center line to move the start or end date of the channel(3) Click and drag center line to move entire Channel drawing horizontally in time(4). Optional: Click on the line for the drop down menu and choose Edit(5). Change colors, adjust standard errors, add extensions, etc.(6). Places a center dashed/solid line with multiple blue lines radiating from the starting point of the drawing. The blue lines are calculated to predict price movements through a relationship of geometric angles based on time and price. Click and drag the cursor from a lower point to a higher point on the chart(1). 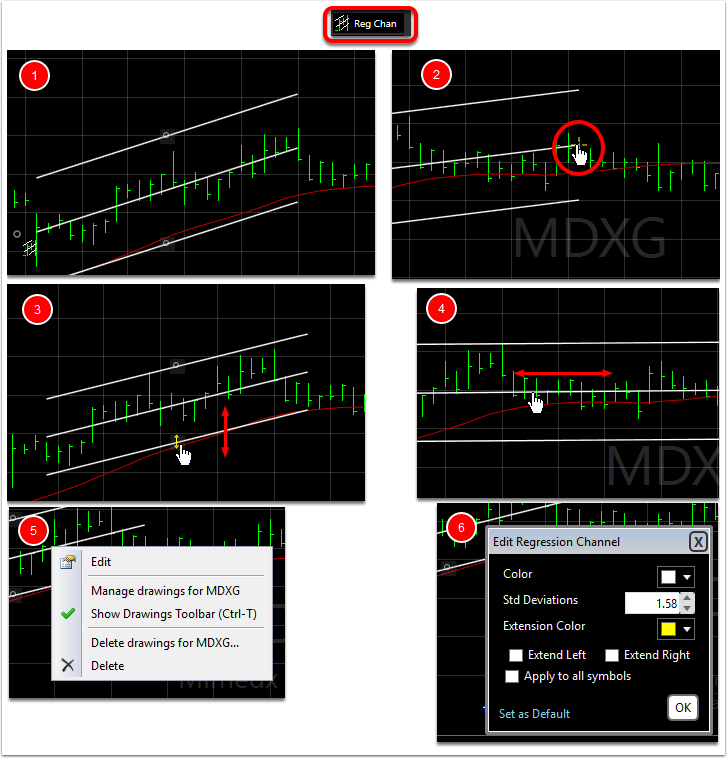 Click and drag either of the outer trendlines to reshape the channel to fit price action(2). Click and drag either endpoint of the center line to move the start or end date of the channel(3) Click and drag center line to move entire Channel drawing horizontally in time(4). Optional: Click on the line for the drop down menu and choose Edit(5). Change colors, adjust standard errors, add extensions, etc.(6). Places a series of lines on the chart calculated by finding the highest-high and the lowest-low during the time period being analyzed. The top line is drawn at the highest price during the time period and the bottom line is drawn at the lowest price during the time period. The remaining three lines are then drawn so they divide the section between the highest-high and the lowest-low into four equal sections. The center line (the "mean") is displayed as a dashed line. Click and drag the cursor from one bar (date) to another bar (date) on the chart(1). This places the horizontal trendlines on the chart. Click and drag either endpoint of the center line to move the start or end date of the channel(2). As the date is changed, the top line readjusts to any new high it encounters. 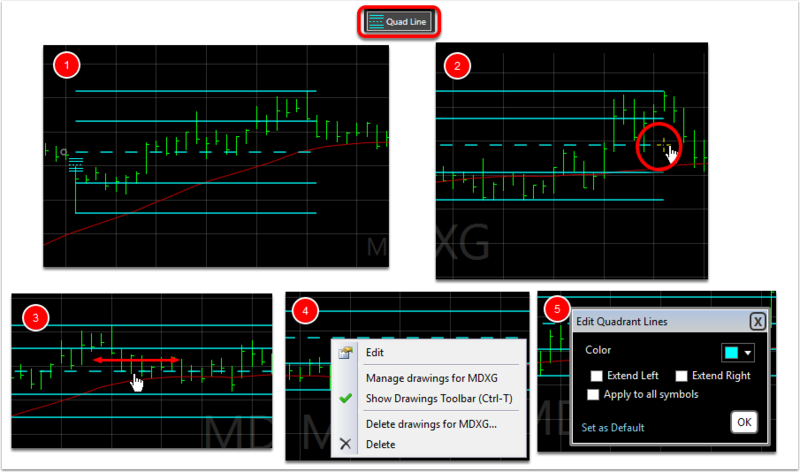 Click and drag center line to move entire Channel drawing horizontally in time(3). Optional: Click on the line for the drop down menu and choose Edit(4). Change colors, add extensions, etc.(4). Places two parallel lines plotted equidistant from a linear regression line. The distance from the regression line is determined by the highest or lowest price for the period, whichever is greater. Click and drag the cursor from one bar (date) to another bar (date) on the chart(1). This places the channel lines on the chart. Click and drag either endpoint of the center line to move the start or end date of the channel(2). As the date is changed, the top line readjusts to the greater of new high or new low it encounters. 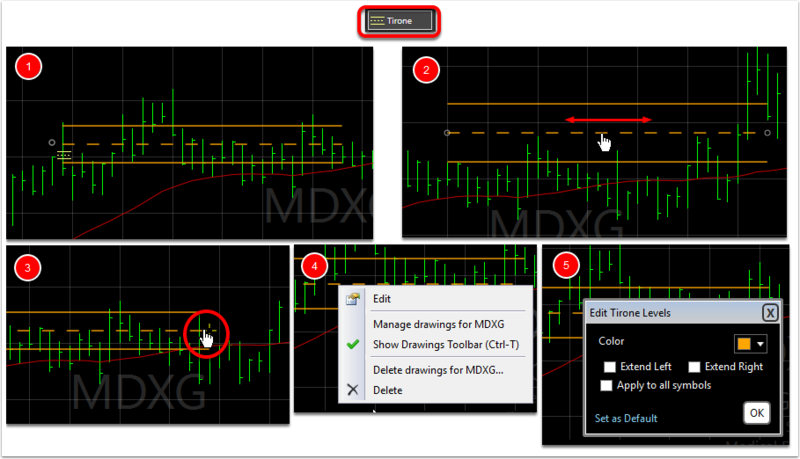 Click and drag center line to move entire Channel drawing horizontally in time(3). Optional: Click on the line for the drop down menu and choose Edit(4). Change colors, add extensions, etc.(4). Places two lines (outer) on chart, each of which is two standard deviations from the linear regression line (center). Click and drag the cursor from one bar (date) to another bar (date) on the chart(1). This places the channel lines on the chart. Click and drag either endpoint of the center line to move the start or end date of the channel(2). Click and drag either of the outer lines to set Standard Deviation on the fly(3) Click and drag center line to move entire Channel drawing horizontally in time(4). Optional: Click on the line for the drop down menu and choose Edit(5). Change colors, adjust Standard Deviation, add extensions, etc.(6). Places three lines on the chart calculated from the low to high of a trend. The lines are equidistant and project possible support and resistance areas. 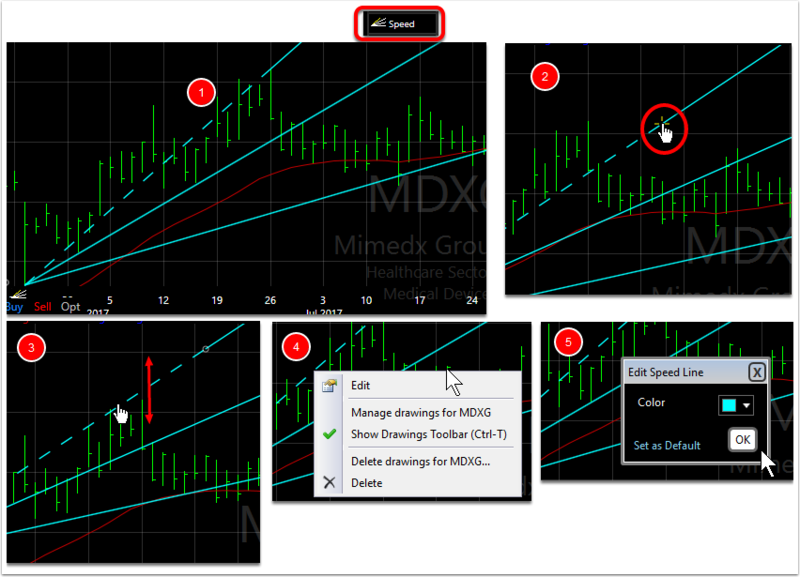 Click and drag the cursor from a lower point to a higher point on the chart(1). 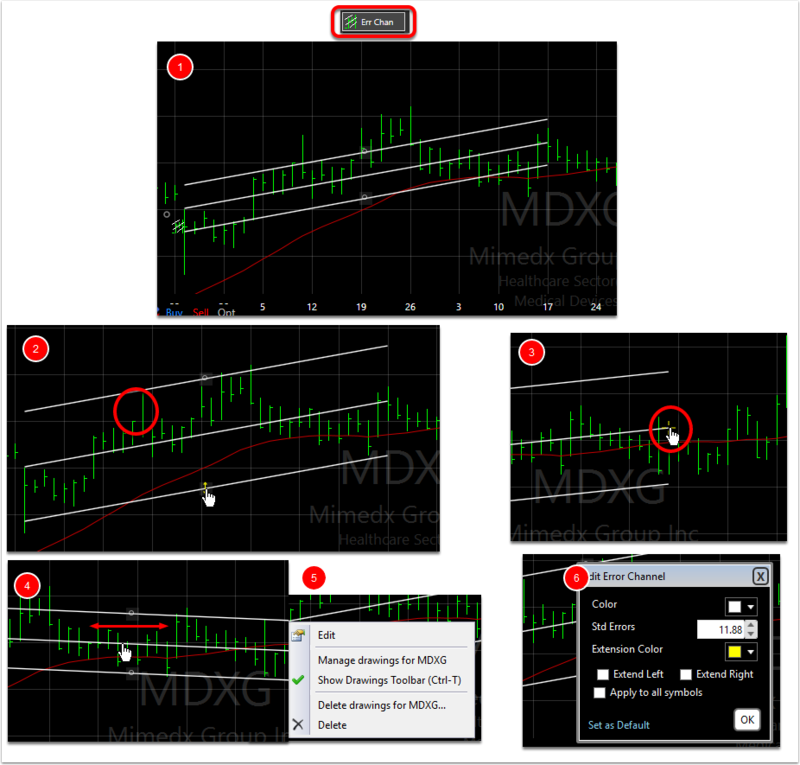 Click and drag either of the outer trendlines to reshape the channel to fit price action(2). Click and drag either endpoint of the center line to move the start or end date of the channel(3) Click and drag center line to move entire Channel drawing horizontally in time(4). Optional: Click on the line for the drop down menu and choose Edit(5). Change colors, adjust standard errors, add extensions, etc. (6).